Google I/O, Google’s largest developer conference, kicked off today where they announced the company’s direction for the near future. First on the list is Google App Engine for Business, which enables companies to develop internal applications on the same secure and reliable infrastructure that Google uses. Google App Engine was released 2 years ago for application developers, but the business engine is intended for use by IT departments. Google’s is also teaming up with VMWare to increase application portability across different development platforms and environments, calling it cloud portability. Companies will be able to deploy applications to a variety of different cloud environments, such as VMWare’s, Google App Engine for Business or Amazon’s EC2 (Elastic Cloud Compute). Google also announced Chrome Web Store, an open marketplace for web applications. The Chrome Web Store makes it easy for people to find a variety of apps on the internet simultaneously allowing developers to reach a larger audience. Additionally, Google announced an open web media project called WebM, which it plans to undertake with a host of other companies including Mozilla, AMD, NVIDIA, Skype and many more. WebM includes VP8, a high quality video codec that will be under a royalty-free license. Undoubtedly this is a response to the recent HTML5 discussions regarding the new standard codec for web video. Currently H.264 is used by many popular websites, including YouTube, unfortunately, H.264 may not remain free indefinitely. The owners of the patent rights, MPEG LA, will likely begin charging for use after 2012. 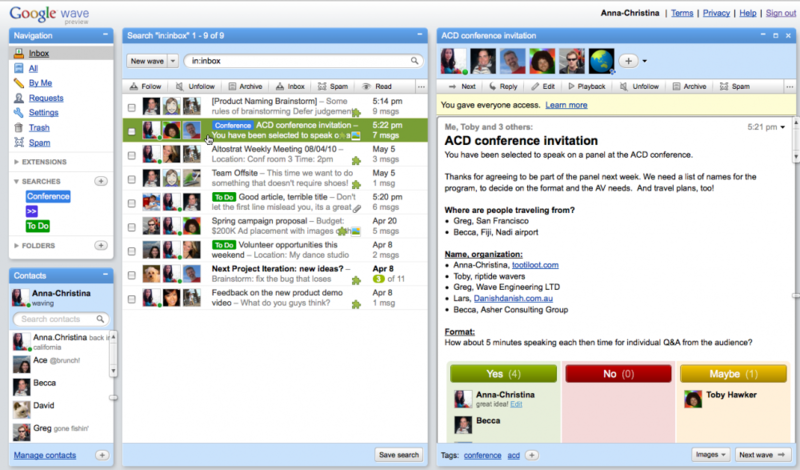 At last year’s conference, Google introduced Google Wave, a communication and collaboration tool initially released as an invite only application. 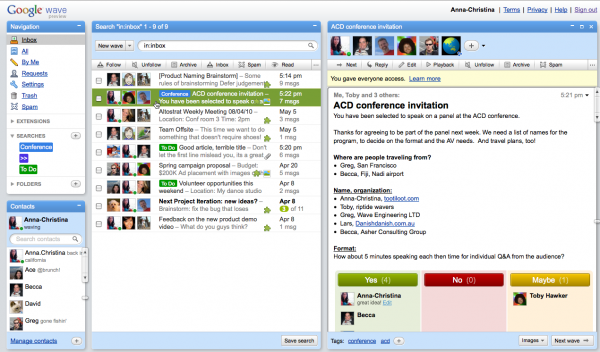 Today, Google announced the public availability of Google Wave, meaning no more need for an invite to use Wave! Additionally, Google App administrators will be able to enable Wave for their domains. This open up much more opportunity for groups to collaborate and work on projects more productively. Google has pitched Wave as a great tool with many different applications and uses, including Business, Education, Journalism, etc. Developers will finally get access to the additional open source components of Wave in order to build their own services. There were also a few other smaller announcements such as Google Maps API Premier, an enterprise-ready mobile maps API. An improvement to AdSense allowing content publishers to improve the relevance of their AdSense ads. Finally, a font API and a library of high-quality open source web fonts. We will bring you more Google I/O news as it comes in so stay posted. Note: We’ll be blogging live from Google I/O Day 2 Keynote, stay tuned!